I suspect I know what you’re thinking. You’re thinking, “Why are Sound On Sound reviewing what is clearly a consumer product”? And it’s a reasonable question because despite KEF’s close links to numerous BBC-designed studio monitors of old, the company always have been primarily a hi-fi brand, with little availability through pro audio retailers or distributors. And, well, hi-fi speakers and pro monitors require different characteristics... don’t they? Well, no. To my way of thinking, and echoing Duke Ellington’s famous thoughts on music, there are only two kinds of speaker: good ones, and “the other kind”. There’s also no escaping the fact that the most iconic nearfield monitor out there, the Yamaha NS10, began life as a hi-fi speaker, and one of the most iconic h-fi speakers, the BBC LS3/5A, began life as a nearfield monitor (although it would be a while after its arrival before the term ‘nearfield’ was coined). 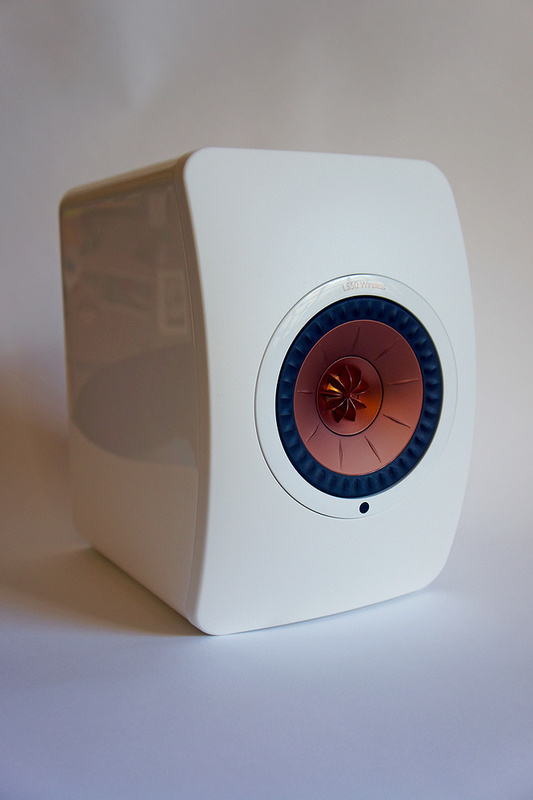 But, if we’re going to review a ‘hi-fi speaker’ as a nearfield monitor, why the KEF LS50 Wireless? Why not a Bowers & Wilkins model or a Mission, or a Monitor Audio? Well, regular readers of my reviews will perhaps have picked up on the occasional mention that one of my favourite speakers for nearfield monitoring is the original, passive version of the KEF LS50. It’s the one I use when there are no review monitors either side of the workstation, and when there are review monitors in place, it’s the one I use as a benchmark reference. I think the LS50 is one of the best (if not the best) compact and reasonably affordable speakers ever made (I bought my pair, previously loved, for under £500). So, when KEF announced a wireless active version, that also happens to incorporate a raft of electroacoustic advances over its predecessor, it was of huge interest and, I think, impossible to ignore here on planet pro-audio. To begin with, however, a bit of description and background. 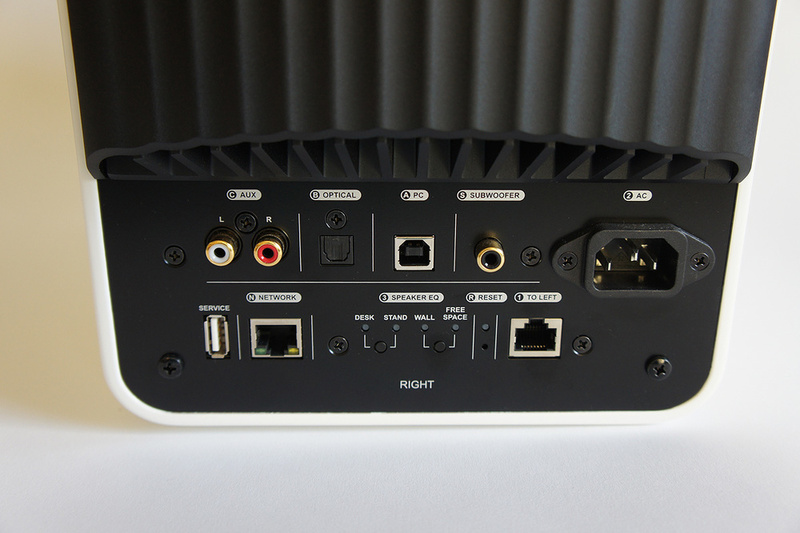 The LS50 Wireless (to be written henceforth as LS50W) is a compact and classy-looking speaker with connection panel, heatsink and reflex port on the back and a touch control panel on the top of the right-channel speaker. The LS50W is wireless in so much as it can connect to a Wi-Fi network and play audio streams. The ‘wireless’ title, however, is not entirely accurate because each speaker of the pair needs mains power, and a network-style cable is used to connect the pair together so that they can talk to each other. The LS50W can also connect to conventional wired input signals. The right-channel speaker is by default the ‘master’ and carries the control panel, configuration switches and input sockets. The left speaker is the ‘slave’ (the right/left master/slave default can be switched). 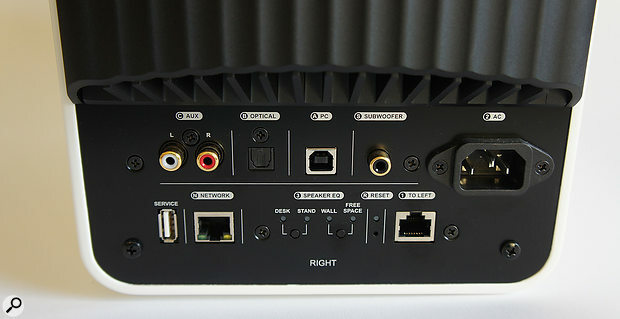 The left speaker rear panel carries just the pairing network socket, its mains input socket and a rotary balance control. I’m sure there’s a good reason why the balance control is on the left speaker, but I’m not sure what it is. I didn’t use it anyway. Along with providing power for the internal A-D, DSP and D-A conversion, those mains inputs also, of course, provide power for a couple of power amplifier channels in each speaker. Interestingly, while the bass/mid amps provide 200 Watts of Class-D power, the tweeter amps provide 30 Watts of Class A/B. The discrepancy between bass/mid and tweeter amplifier power ratings arises partly because the tweeter is more sensitive than the bass/mid driver (so needs less power), and partly because headroom is required on the bass/mid amplifier to enable LF equalisation to be applied. The decision to use Class A/B for the tweeter was taken on sound quality grounds. The LS50 cabinet is constructed from a rounded and gloss-finished MDF carcass attached to a gently curved and matte-finished, dough-moulded composite front panel. The curve and soft edges of the front panel will help to minimise the smearing effect of edge diffraction. The cabinet is comprehensively braced and damped internally and KEF make quite a play of the FEA (Finite Element Analysis) simulation techniques used to optimise its design in order to minimise panel resonance. It certainly sounds dead to the high-tech knuckle tap. The previously mentioned reflex port exits through the amplifier heatsink on the rear panel and is somewhat more sophisticated in design than the simple plastic tubes I sometimes find myself describing. The tube is elliptical in section, with generous flaring on both entrance and exit, but most unusually, it is constructed internally from a flexible material that’s designed to help suppress the ‘organ pipe’ resonant mode that reflex ports often display. The clean and resonance-free curve in Diagram 1 illustrates the success of the KEF port design in those terms. The most distinguishing feature of the LS50W is the matte-copper-finished, dual-concentric — or, more correctly, dual-coincident — compound driver. The difference between the ‘dual-concentric’ and ‘dual-coincident’ terms distinguishes the KEF-style driver from earlier compound driver designs, such as the classic Tannoy unit developed by Ronald Rackham in 1948. Rackham’s Tannoy driver located the tweeter on the same central axis as the bass/mid diaphragm, but at a position behind the magnet, so it’s laterally displaced. In contrast, the KEF-style compound driver places the tweeter right at the apex of the bass/mid diaphragm, so not only is it on the same central axis, it’s effectively at the same position in space — hence ‘coincident’. The voice coils of the bass/mid driver and tweeter are both laterally and axially aligned, so their effective acoustic source positions are the same. 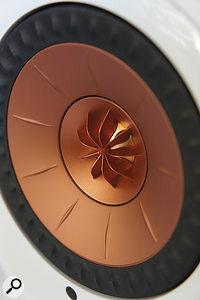 KEF introduced their first dual-coincident driver in the mid 1980s. It was was made possible by the development of high-power NeFeB (Neodymium-Iron-Boron) magnetic materials, which made it possible to build a dome tweeter compact enough to fit on the end of a bass/mid driver pole-piece. Patents were granted to KEF that protected the dual-coincident technology and were mostly effective in restricting competitors from exploiting similar ideas for a couple of decades. Even after the original patent protection had lapsed, later KEF patents covering refinements to the basic idea continue to limit the scope for other manufacturers to compete. This could well be one reason why the compound driver in the Pioneer RM monitors has its tweeter mounted slightly forward of the bass/mid diaphragm apex. But what, you might by now be asking, are the advantages of the dual-coincident format? Firstly, at a stroke, it fixes a fundamental problem of conventional multi-way speakers with displaced drivers: their phase relationship changes with listening position. It’s simply a matter of geometry: move your head, and the relative distance from your ears to the bass/mid driver and tweeter (in a conventional two-way system) changes. This means that in the crossover region where the output from the two drivers overlaps, the frequency response of the direct sound varies significantly as the relative phase of the outputs from the two changes. Putting a time-domain slant on this, dual-coincident means that the signal arrival time from bass/mid driver and tweeter is the same at all listening positions. This is illustrated in Diagram 2, showing the step response of the LS50W (literally, the response to a simple step change input signal) compared to the step response of a conventional two-way monitor). Secondly, the dispersion discontinuity that typically occurs in two-way speakers, where the relatively narrow dispersion of the bass/mid driver towards the top end of its range joins the much wider dispersion of the tweeter, is avoided. In a dual-coincident arrangement, the dispersion of the tweeter is defined by the dimensions and profile of the bass/mid diaphragm. When KEF first launched their dual-coincident technology, they christened it ‘Uni-Q’, ‘Q’ being an acoustician’s term for directivity. This consistency of directivity from, effectively, a point source is, I think, particularly suited to nearfield listening. Diagram 3 illustrates the dispersion consistency of the LS50W. KEF have now been developing their dual-coincident technology for over 30 years and, in contrast to the relatively primitive early Uni-Q drivers, the compound driver fitted to the LS50W is decidedly high-tech. In fact there are not too many drivers out there in either pro or hi-fi sectors that have it beaten in terms of engineering and technology. Its bass/mid element is a 130mm magnesium/aluminium-alloy diaphragm driven by a 50mm-diameter voice coil. The diaphragm is unusual not only for its material but also for its radially reinforced profile and radially pleated rubber surround. Rather than to play a role primarily in bass/mid driver performance, the last of these features is actually designed to present less of a diffraction-causing discontinuity to the tweeter radiation than would a conventional half-roll surround. And speaking of the tweeter, it’s a 25mm, rear-vented, reinforced-aluminium dome device driven by a NeFeB magnet, but perhaps its most interesting aspect is the ‘tangerine’ waveguide and short horn. The tangerine waveguide is designed to compensate for a fundamental technical aspect of acoustic radiation from a dome that, while obvious when you think about it, mostly goes unappreciated. Imagine a dome moving axially backwards and forwards. Acoustic radiation will be proportional to the velocity along the axis of movement. However, the profile of the dome, increasingly sloped towards its outside, means that the perpendicular axial velocity effectively falls towards the periphery (the inverse is true for a cone diaphragm). So the dome output level reduces across its radius. The action of the tangerine waveguide is to increase the acoustic impedance presented to the dome towards its periphery and so compensate for the drop in output. It’s as if the dome operates as a direct radiator at the centre and morphs towards a compression driver model at the outside. It’s a neat solution to the problem and one you probably won’t see elsewhere because, of course, it’s patent protected. Around the outside of the tangerine is a ‘horn’ profiled wave-guide section that extends a significant distance into the bass/mid diaphragm and smoothly integrates the tweeter with the diaphragm profile. The effective integration of the tweeter and bass/mid driver radiation is an area of Uni-Q technology that has developed significantly over the decades and is fundamental to the way KEF have optimised the dual-coincident concept. I wrote earlier that one of the benefits of the dual-coincident format is that it consolidates the dispersion characteristics of the bass/mid and tweeter diaphragms, and it does. Optimising the phenomenon, however, falls into the ’easier said than done’ category. In order to make it work well there’s a number of conflicting factors to be resolved. Firstly, the bass/mid diaphragm profile that works best in terms of that driver’s mechanical/acoustic performance might not be the profile that works best in terms of tweeter radiation and dispersion. So perhaps the stiffening ‘creases’ of the LS50 bass/mid diaphragm are present partly to enable a little more latitude in its physical profile to suit tweeter radiation demands. Secondly, the bass/mid driver diaphragm, unavoidably, isn’t stationary and this is potentially a problem in terms of intermodulation distortion. Intermodulation distortion occurs when, as the name suggests, one signal modulates another, resulting in the generation of sum and difference signals not present in the input. Speakers generally are prone to it, there being a number of mechanisms that can potentially result in intermodulation. But with movement of the bass/mid diaphragm in very close proximity to the tweeter dome, dual-coincident systems have a potential intermodulation mechanism that conventional speakers don’t. So part of the role of the horn section around the tangerine waveguide on the KEF driver is, I suspect, to constrain the radiation of the tweeter and minimise the potential for intermodulation. Moving away from the dual-coincident driver, the LS50W is an unconventional beast in other respects too. This is primarily because it’s a consumer hi-fi speaker aimed mainly at users who have fully embraced the contemporary digital, networked and streamed audio paradigm. The most obvious aspect of its unconventional nature is in the complement of inputs provided. Along with conventional unbalanced analogue and S/PDIF optical digital inputs, the LS50W can play Spotify and Tidal streams wirelessly, play from DLNA-compatible servers and over Bluetooth, and operate as a USB device (so DAW apps will see it as an audio output). It also ships with a remote control and has an iOS/Android app for setup and control. The lack of balanced analogue audio inputs and the addition of touch-panel, handset or app-based volume control left me scratching my head a little over the best way to integrate the LS50W into my DAW setup (Pro Tools with, currently, a second-generation Focusrite Scarlett 18i20). Though not ideal (being unbalanced), the analogue inputs worked perfectly well and it was possible to set the volume of the LS50W at, or near, maximum (although frustratingly, there’s no indication of volume on the speaker itself or in its app) and treat them as conventional active monitors with volume control on the interface. However, the LS50W incorporates internal DSP, so analogue input signals go through an entire A-D/D-A process, and a signal chain incorporating that extra conversion round trip doesn’t seem ideal. Using the LS50 as a USB output device in the DAW also worked perfectly, and to my ears, sounded better than the analogue inputs, however as soon as the DAW job in hand leaves ‘the box’ and requires inputs or outputs, or even a pair of headphones or a second pair of monitors, it’s no good if the monitors have exclusive use of the DAW interface. By default, the right speaker acts as the ‘master’, and is where the speaker EQ controls, analogue and digital audio inputs, and Ethernet link output socket are located. A solution to this conundrum came to me in the form of a TC Electronic BMC-2 DAC/monitor controller (for which I’ve promised to thank KMR Audio for the loan). The BMC-2 provides three digital inputs and well-implemented digital volume control, so by taking an optical output from the Scarlett interface I could connect the LS50W digital optical input to the BMC-2 and have both a fully digital monitoring chain and convenient desktop volume control. Conveniently, the BMC-2 can also drive a second pair of monitors from its analogue outputs so I could simultaneously connect my passive LS50s (given a clean bill of health following a technical once-over by KEF) and be able to directly compare the active LS50W and the passive LS50. Before I get to how that comparison panned out there’s just one more aspect of the LS50W to describe. I’ve mentioned a couple of times that the LS50W incorporates some DSP, but haven’t explained why. There’s effectively four elements to it. Firstly, the 2.2kHz crossover between the bass/mid and tweeter is done in the digital domain, and secondly, the DSP provides analysis of the input signal so the trade-off between low-frequency bandwidth and volume level can be optimised. It means that the diaphragm displacement-limited power handling can be maximised, which is decidedly useful on a speaker with a relatively small LF radiating area. The third DSP function is to compensate for the phase (time) changes that occur over the mid to HF frequency band, the most obvious of course being those introduced by the crossover filters and driver voice-coil inductance. A linear-phase response throughout the audio band has long been a holy grail of speaker design and while a few monitors claim to achieve it, in reality it’s not truly possible on multi-way speakers with physically displaced drivers. You can have linear phase at discrete positions in space where the driver-to-ear flight time is equal but, as mentioned earlier, as soon as you move your head, it’s gone. With a dual-coincident driver, however, it’s very much worth equalising phase because the distance between each ear and the two drivers remains constant. The step response in Diagram 2 shows clearly how the two drivers of the KEF LS50 are time-coincident (the LS50W DSP helps here too of course, and it’s also the case that if I’d moved the measuring microphone, the conventional speaker step response in Diagram 2 may well have looked better). The final LS50W DSP function is to provide some environmental EQ — accessible from push switches on the back of the right speaker or, more conveniently, via the app. Variable ‘desk’, ‘wall’ and high-frequency EQ functions are provided along with three LF extension options. For what it’s worth, in my room, a little desk and wall attenuation worked well and I preferred the less extended LF option. So how did the comparison between the old passive and new active LS50W go? It went extremely well as it turns out. The LS50W sounds unmistakably like my passive LS50, only more so. I played both familiar and unfamiliar material from Pro Tools sessions and CDs, but also, thanks to the range of inputs the LS50W offers and its network-connected nature, hi-res streams from servers and slightly less hi-res streams from Spotify came into play. One advantage of the ‘consumer’ nature of the LS50W in a pro environment is that it provides such easy access to as wide a range of audio sources as it’s possible to imagine. If your monitoring setup is occasionally required for ‘entertainment’ listening rather than work, the LS50W makes a decidedly strong case for itself. Being compact and consequently relatively limited in terms of both maximum volume level and low-frequency extension, the LS50W will never be fully in its comfort zone playing the role of a main or midfield monitor, but it’s actually able to play surprisingly loud, and in my room never sounded as if it was up against its limits. Having said that, its fundamental quality and revealing nature meant that there was little to be gained in monitoring terms by pushing the volume level too far. Listening to familiar mixes and material I was immediately comfortable with the tonal balance while at the same time impressed that I could hear easily down into the layers of the mix so that details, both good and bad, were more apparent and so easier to either work with and emphasise, or deal with and suppress. I mentioned previously that I preferred the less extended LF options of the three that the LS50W offers, and that to some extent reflects my only concern over its performance: its reflex-loaded bass. KEF supply foam bungs with the passive LS50 to block the ports and that’s how I normally use them, the more explicit bass detail and more secure sense of timing being of greater worth to my ears than wider bandwidth. There are no port bungs supplied with the LS50W, but using the LS50 bungs and selecting the ‘Extra’ LF EQ option produced what I felt was the best result, although it was a very close-run thing with the less extended EQ option without bungs. In the grand scheme of things though, the LS50W reflex-loaded bass is very far from a deal breaker and in comparison to many reflex-loaded speakers the negative influence of the port is subtle. Moving further up the band, the LS50W is one of those monitors — simply because it sounds so natural and uncoloured — for which there’s not a great deal to say. The mid-range, especially on voices, offers great clarity, yet still has warmth, and the high frequencies from that coincident tweeter are detailed and delicate, yet there’s still HF power when it’s needed. The stereo imagery and portrayal of depth effects is absolutely among the best I’ve heard. I hate to fall into the trap, because the basic principle of a dual-coincident design is coherence, but the whole performance just hangs together in a way that simply sounds right. I’m going to conclude by referring back once again to the passive LS50 for a moment. The qualities it delivers so effectively are a combination of neutrality in terms of tonal balance, dispersion consistency for nearfield listening, pin-sharp imaging, and the hear-through clarity that comes from minimal enclosure character, low distortion and, of course, time-domain coherence. The LS50W has all of those characteristics but to each one it adds a significant extra level of quality and ability. It may be a hi-fi speaker, but it’s a brilliant little nearfield monitor too. There are of course numerous active monitors that would make interesting options. For example, ploughing a similar technological furrow but at a significantly higher price is the Genelec 8331. Again more expensive but technically very capable is the Neumann KH310. Technically interesting options closer to the KEF price are the Pioneer RM07, the PSI A14-M and the Unity Audio Pebble. Imagine that a bass/mid driver is reproducing an 80Hz signal at a relatively high level so the diaphragm is pumping backwards and forwards pretty vigorously. At the same time, the tweeter is reproducing a 3kHz signal. Depending on their relative levels and the degree of coupling between the two signals, ghost signals at 3.08 and 2.92 kHz will be generated. Those signals constitute intermodulation distortion. Of course, intermodulation distortion is only likely to reach significant levels when a bass/mid diaphragm is moving a significant distance, and that will only be at low frequencies. So in a radical about-turn of my usual opinion (that the only good reflex port is a blocked reflex port), there’s potentially an argument for reflex loading on the LS50 because the reduction in bass/mid diaphragm movement that results will reduce intermodulation distortion. Unique and seriously high-performance electro-acoustics. Fantastic combination of tonal neutrality, clarity and consistency. Aimed at consumer use so ‘quirky’ in a studio setting. Closed-box bass might have been nice. The LS50W represents the cutting edge of electro-acoustic technology and is without doubt one of the best compact active speakers around in either the pro or consumer sectors. If you’re in the market for compact monitoring at around the LS50W price, or even significantly above, you should hear it. £2000 per pair including VAT.